Priscillas: My first Craigslist shopping ! Hello and thanks for stopping by ! 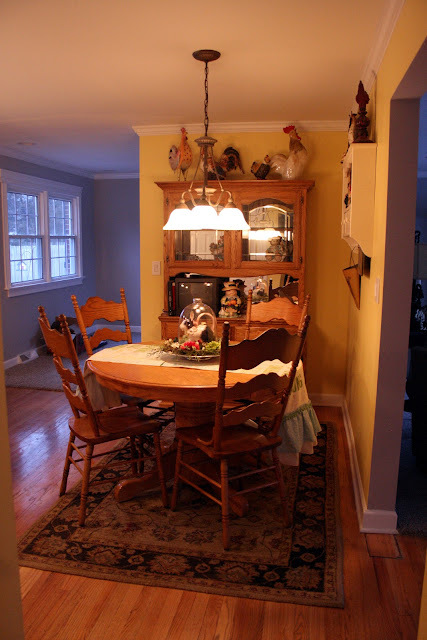 I see all the time in blogland how people get great deals on Craigs list ,so last week I went looking and I think I found some great things !Since we widened the doorway into the kitchen ( from both the dining room and foyer ) our eat in kitchen part is smaller . We had a rectangle table with 6 chairs. I was looking on Craigs list for a round table with a leaf and 6 chairs , and I found this one ! I liked my chairs better so I kept them and just switched out the table. 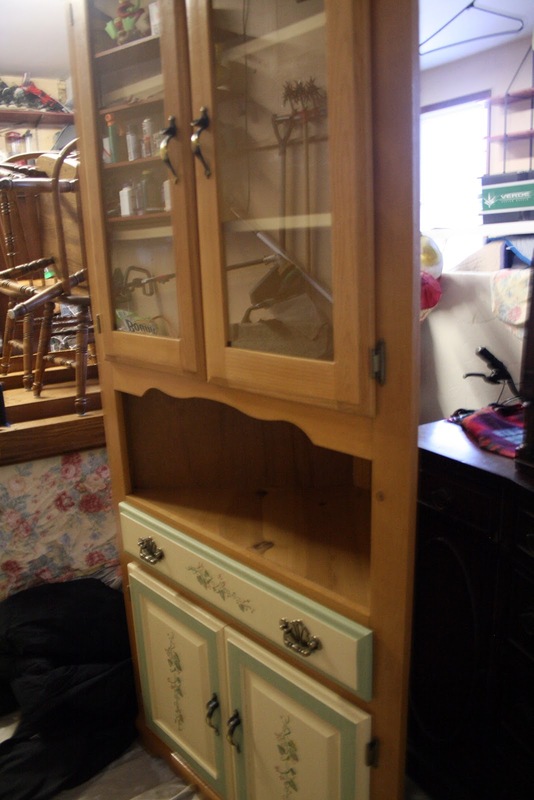 I thought I was going to have to get rid of my hutch so on Saturday I also bought a corner hutch. With the new small table I can keep my old hutch..( I need a new rug that doesn't hang over into the doorway ) I am thinking a round one ? The table has the big pedestal base just like the one I love from pottery barn. 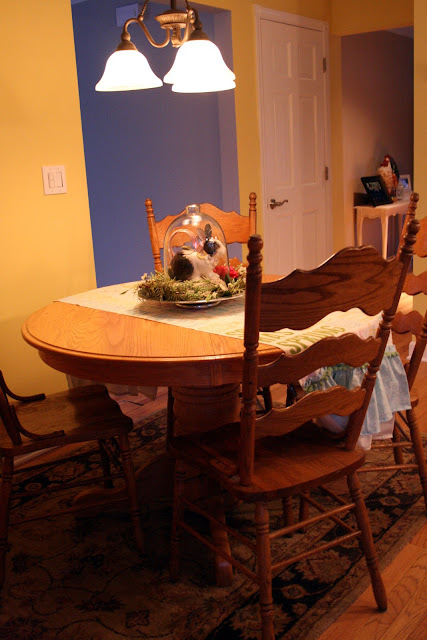 I am going to paint the hutch and the table and chairs white. ( my husband is trying to get me to keep the top of the table wood) I like the whole thing white.. so we will see :) Below is the table I love from pottery barn. Looks the same except it is $800.00 ! We decided to put the big curio cabinet back in the living room ( I still need to fill it) and put the couch up against the windows. This was how it was pre remodel. Seems more like home :) We still need a coffee table , more on the walls and a dining room set ! This is our garage at the moment ..Furniture city ... Those are the chairs I got with the round table on top of our old kitchen table and the old dining room table. we are going to try and sell the old dining set and kitchen set on Craigslist. 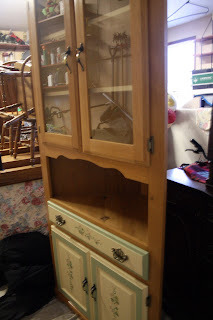 This is the corner cabinet I bought and was going to paint white..It might still go into the kitchen if I decide to get rid of the bigger one , or maybe down the basement in my craft room.. I paid $ 80.00 so I think I got a great deal. Puffy flower balnket progress .. Ive been just using up one skein of yarn at a time for the flowers , thats why theres so many of certain colors and not enough of others.. 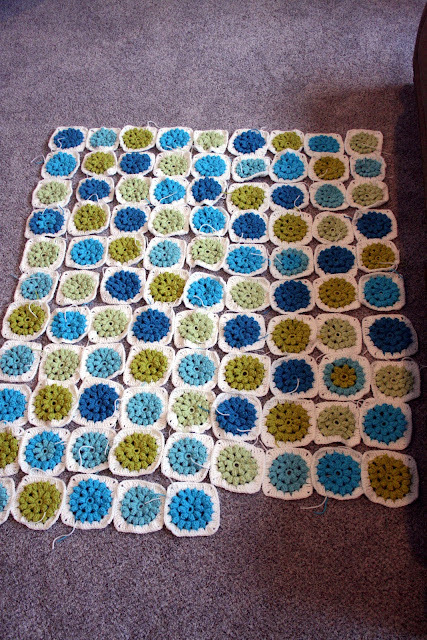 I am working on the two darker aquas right now. 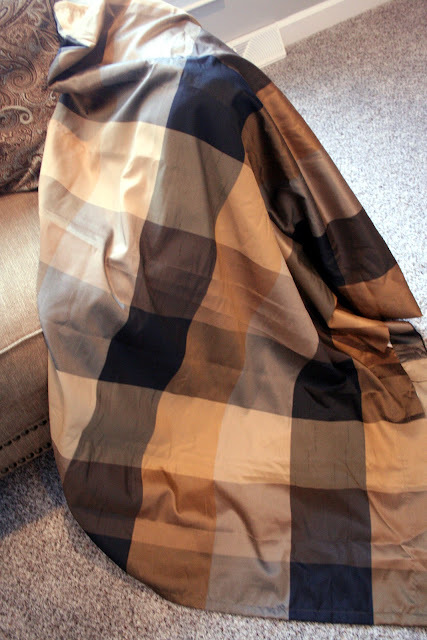 These are the drapes we are going with for the living room. 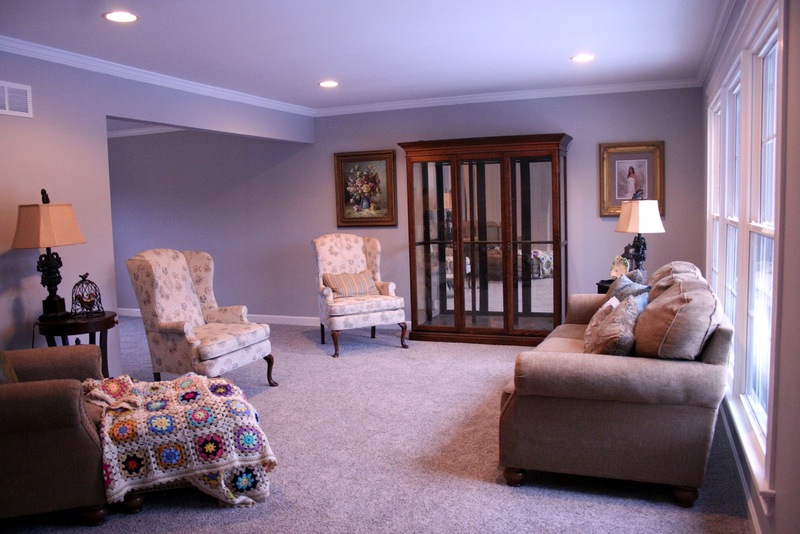 They have the grays from the carpet and walls and the burlap color from the couch and chair. I found them at Lowes ..Love them ! Thnaks for visiting and your nice comments ! Hope you all have a wonderful week! Your Craig's list purchases are wonderful! My niece & her husband also found an amazing dining room set on Craig's list - it's beautiful!. Your remodeling is coming along beautifully. Your home is looking so pretty. Your breakfast room is so inviting! Great luck on Craig's List. And that corner cabinet is wonderful--just love it and you can't beat the price! Priscilla I have never bought anything off of Craigslist, but my kids sure do. I can't wait till I get to the decorating point like you. I do need a table for the kitchen. Would like a farmhouse one. Kindof neat to wait and see what shape fits best. I love the white table too. Men (including my hubby) have a hard time letting go of wood. lol! Glad that you will be sharing with SYC. Here you do better with Kijiji! Great bargains!! 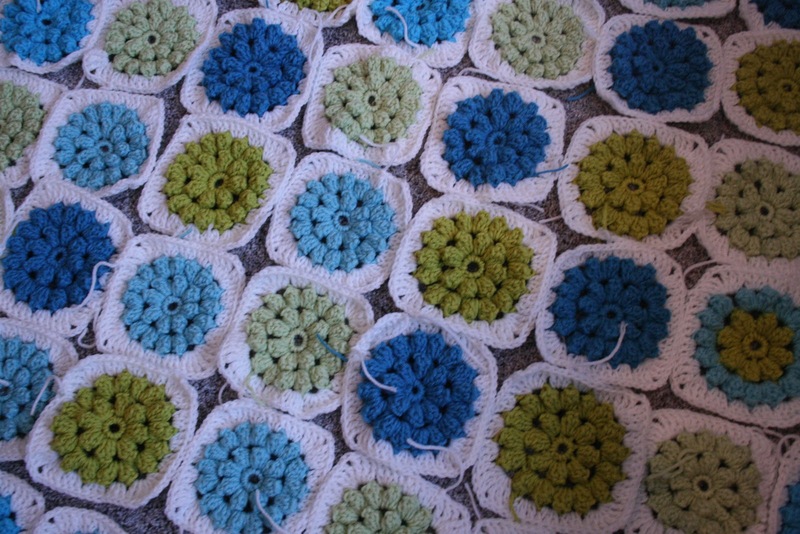 Love the crocheted afghan on the ottoman. 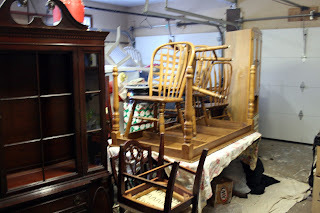 Have always wanted a corner hutch...or two...and have never gotten one (or two). I'm drooling over yours! All of your rooms look beautiful! More drooling from this reader! I love getting a peek into your home, and that puff blanket is gorgeous! 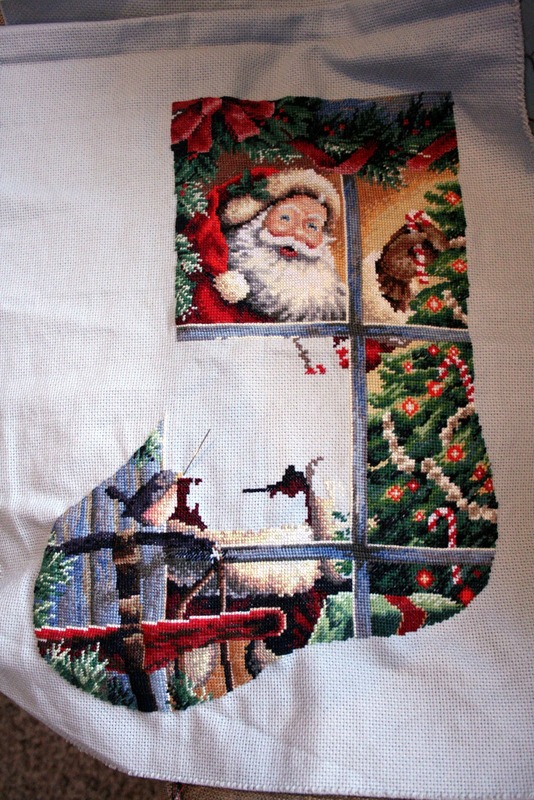 Care to share a link to the pattern? Thanks for linking up on Hookin On Hump Day! That puff blanket is to die for!! Completely in love with it! :o) Happy Hookin on a Hump Day! I love this blanket, and can't find the pattern anywhere, could you post yours?? I too love the blanket, but can't find the pattern. Will you post a link, please?